technique of composing a work of art by pasting on a single surface various materials not normally associated with one another, as newspaper clippings, parts of photographs, theater tickets, and fragments of an envelope. a work of art produced by this technique. verb (used with object), collaged, collaging. The artist has collaged old photos, cartoon figures, and telephone numbers into a unique work of art. Psalm 119:11 " I have hidden your word in my heart"
Technique: 12x12 canvas, collage with song pages, using a mask and modeling paste for the heart, then a different stencil for the tiny squares. When dry, use spray inks in multiple colors. Add a printed verse and you have created a beautiful Godly work of art to have in your home or give as a gift! "One Word” is a project designed to move you beyond the new year resolutions that we all make and break! The challenge is simple: lose the long list of changes you want to make this year and instead pick ONE WORD and stay focused on it for one year. You will find clarity by taking all your big plans for life change and narrowing them down into a single focus. Just one word that centers on your character and creates a vision for the year. In 2009 my word was Trust- my first experience really relying on God. Using a 16x20 canvas, paint the background, add words that reflect your one word- persistence, precious, mighty, dare, nurture, simple, forever, always, journey, a work in progress, simplify, progress, the greatest love of all, determination, grow, experience, time, always, be brave, patience. Marking moments in family life are important to chart the way the movement of the Spirit touches our children. I had the opportunity to visit the studio of Diane Marra and make this canvas Faith Art with one daughter as the gift to another daughter for a wedding shower. We chose the word Covenant as a reminder of the promise of the Lord as the center of a Christ union in marriage. May it be a blessing to them to see this displayed in their new home and a testimony of the sanctity of their marriage promise. 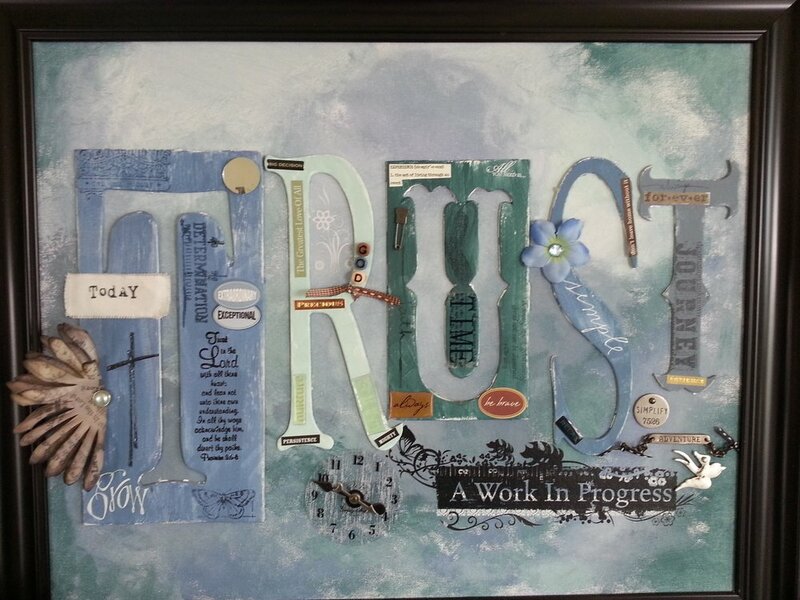 This mixed media project used stamps, paint and chipboard as well as dimensional additions to bring life to the canvas. Thanks Diane for helping us to create this one of a kind gift! It is important to help families claim all family celebrations as sacred and visual reminders are wonderful place markers. Jesus gave it all on the cross and it was the ultimate expression of Love. A 12x12 canvas, cross created with a stencil and modeling paste. Ephemera addedto focus on the Love on the cross. Great way to evangelize in your home.